Summer weekend instructions: Take Amtrak to Seattle, wear comfortable shoes, and wield a healthy appetite. To those who wonder why Portlanders endure dark, rainy, endless winters, the next three months should (let’s hope) provide the reasons we choose to endure it at all. With zero humidity, gentle wafting breezes, day-after-day highs in the mid-eighties, unobstructed views of not-too-distant peaks, and nary a cloud in the sky between July and September, Portland summers are about as perfect as summers can be. The only thing that compares to a summer day in the City of Roses is one spent three hours north. 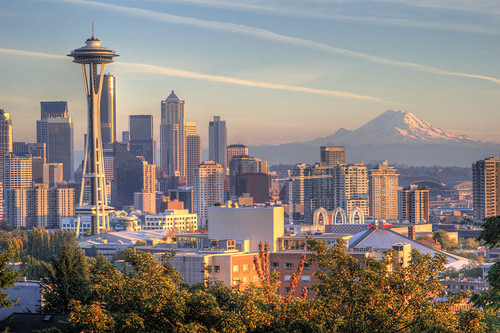 With its myriad inlets, lakes, beaches, harbors, and views of extreme, rugged saw-toothed peaks in every direction, there are few cities in the world blessed with a more impressive backdrop for a summertime culinary excursion than Seattle. And with several daily trains that leave Portland’s Union Station, this is an easy weekend trip to take. Catching Amtrak from downtown Portland to the Emerald City is as easy as taking the Portland Streetcar to South Waterfront. The only difference is that the trip to Seattle lasts three hours longer, it hugs the shoreline along Puget Sound with views of the Olympic Mountain Range dominating the horizon, and cold beer is served all along the way. The calming of the mind ought to be complete by the time the train pulls into Seattle’s Union Station. The adventure continues with a cheap cab ride to one of many downtown hotels. Thanks to a compact and pedestrian-friendly urban core and reliable public transport, all that’s required for a weekend of culinary fun is a comfortable pair of shoes and a healthy appetite. Spur calls itself an urban pub, and with such diverse entry points to its seasonally devoted fare as a $75-dollar five-course tasting menu or a wonderful $15 burger ($21 capped with a thick slab of pork belly), the spirit of the pub is kept alive in a modern space that could have been airlifted from Tokyo. Cocktails shine and desserts are among the most creative in Seattle. Zig Zag is the epicenter for Seattle’s creative cocktail scene. Try the Rendezvous, which mingles gin, Campari, and kirsh for a slight variation on the Negroni, one of summer’s favorite drinks. Pike Street Fish Fry is the size of a college dorm room that on a busy night is crammed with more bodies than a subway car during Manhattan rush hour. They come for what might be the best fish and chips this side of the pond, made from unusual suspects like catfish and calamari alongside the ubiquitous offerings of salmon and cod. Good as the fish can be, I say it’s the wheels of fried lemons that accompany each and every order that ensures return visits. Pike Street Fish Fry is also veg-friendly, with fried asparagus or green beans. Seattle is not only the town that gave the world Starbucks (A company that now provides 16,000 clean, safe, and hassle-free urban restroom locations world-wide), but it is also the birthplace of the modern style of artisan coffee culture that has swept the country. The folks behind this walk-up Capital Hill kiosk are said to have brought latte art to the US. True or not, Vivace still serves one of the best cappuccinos in Seattle. Downtown Seattle’s Le Pichet is one restaurant I wish I could transplant in Portland, and this second eatery by its proprietors is even better in that it serves crispy pommes-frites, omelets of Comte and ham, or the city’s best croque monsieur from 9am until late. For a lesson in beautiful, simple food, you can do no better than to pull up a seat to Chef Jason Stratton’s counter on Friday or Saturday night. From there, enjoy ten courses of whatever Stratton feels like sending out and see why he was named among Food and Wine Magazine’s Best New Chefs in 2010. There are only four counter seats, so reserve accordingly. I’m a sucker for tradition, and a morning trip to The Crumpet Shop on the days I depart Seattle is one from which I cannot deviate. For beginners, a crumpet is a spongy, porous English muffin. And when capped with butter and a thick glob of seasonal jam, there is no going back to mere toast. The only problem is, The Crumpet Shop is located in Seattle, and is one of many great reasons to return. The original Seattle Ace was not only the template for what’s now a nationally recognized growing brand, it was one of the first affordable yet stylish European-style boutique hotels that increasingly dot the urban landscape. With its spacious suites, its prime location, its high ceilings, its complementary wine hours, its friendly staff, and newspaper delivered to the door each and every morning, there is simply not a better place to stay in Seattle than the Alexis Hotel. Once upon a time, Portlanders took great pleasure in deriding its big sister city for its lack of transportation infrastructure. Those days are gone. The city that gave the world modern aviation and Microsoft recently unveiled its first light-rail line, added a streetcar loop to connect its shopping district with the budding hub of South Lake Union, and its clean and efficient bus system runs often and to everywhere you need to go. Visit King County Metro.